California FreshWorks is a loan and grant program that provides financing to increase access to affordable, healthy food in low-income and underserved communities in California. We work with a variety of businesses that grow, aggregate, distribute, and sell healthy food in a way that builds a sustainable local food system, increases community ownership, and promotes equitable economic development. 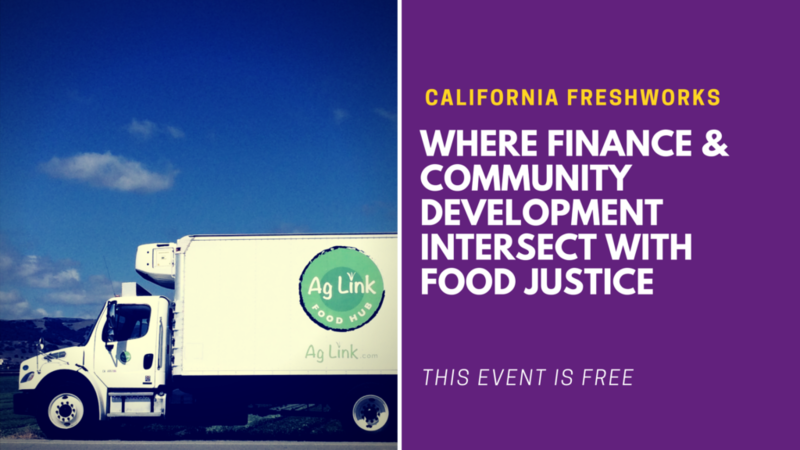 Join us in Sacramento for a panel conversation to learn more about California FreshWorks and the way in which the program pairs financing with tools and services that help enterprises overcome barriers to financing and build their capacity to sustain a successful business. Examples include credit enhancements that improve a small businesses’ risk profile, and technical assistance that builds business capacity and is responsive to the unique needs of each project and enterprise. We will highlight Ag Link, a Ballico-based business that serves as a hub connecting Central California farm and food producers with school districts to create healthier school meal programs. With FreshWorks investment and support, Ag Link was able to increase their capacity, resulting in the ability to leverage new partnerships for increased impact.